Shy. Sheepish. Refreshing. Often nonplussed. At times, awkward (see her Indian Wells trophy speech). 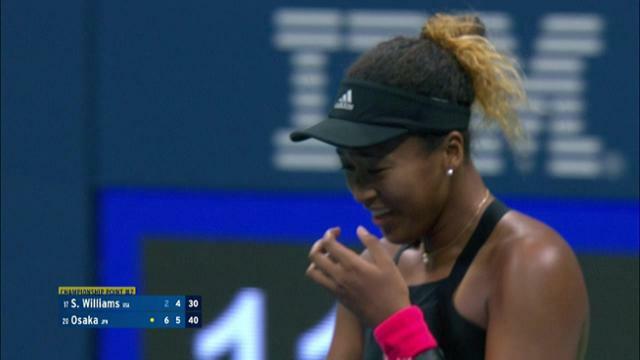 But as we saw on Saturday night at the US Open, there’s a calculating/calm/cool/collected competitor inside the 5-foot-11 frame of 20-year-old Japanese-Haitian-American Naomi Osaka, who kept her composure and then some while contesting her first Grand Slam final before a heavily pro-Serena Williams crowd of over 23,000 in Arthur Ashe Stadium, standing on the opposite side of the net from her childhood hero. And she did it under the most difficult of circumstances. SEE ALSO: Naomi Osaka derailed Serena Williams in a dramatic women's singles final, 6-2, 6-4, to claim her first career Grand Slam title. Osaka held her nerve to serve out the match and halt Williams, who was contesting her second final is as many majors, from tying Margaret Court's record of 24 women's singles titles. She’d struggled on this court before, having squandered a 5-1 third-set lead against Madison Keys two years ago in the third round, leaving the court in tears. There would be plenty of tears after Saturday’s final, too, when the 20th seed closed out a stunning 6-2, 6-4 upset of the new mom Williams, who was seeking her 24th major — a number that would have put her side-by side with Margaret Court as the sport’s all-time leader in that category. Striking the ball with as much authority as anyone on the tour, Osaka, who in March captured what was until then the biggest trophy of her career in the California desert, pushed her 36-year-old foe around the court through much of the one-hour, 19-minute final. She even out-aced the most powerful server in the history of women’s tennis, 6-3. Even when the history-chasing Williams began to jaw with chair ump Carlos Ramos — a code violation, point penalty and game penalty were handed down — and the match took a turn for the bizarre, she maintained her equilibrium, well aware of the ramifications of losing her focus. But Osaka, the first Japanese player — man or woman — ever to win a Grand Slam title, showed some ahead-of-her-years maturity. During the more-than-strained trophy presentation, Osaka even apologized to the ticketholders. SEE ALSO: Sascha Bajin has gone from hitting partner to coach after working with the likes of Serena Williams, Victoria Azarenka and Caroline Wozniacki. His newest charge, Naomi Osaka, is into her first Grand Slam semifinal at the US Open. Osaka’s run to the 2018 title included 6-0, 6-0 and 6-1, 6-1 demolitions of Aliaksandra Sasnovich and Lesia Tsurenko, respectively, and a redemptive 6-2, 6-4 triumph over Keys in the semis, avenging her crushing loss to the American on the very same court in 2016. Entering the final, she had dropped just 28 games through six matches. She became the youngest woman to reach the US Open final since Caroline Wozniacki in 2009. In lifting the trophy, she became the youngest tournament titlist since Maria Sharapova in 2006. "She really wanted to have the 24th Grand Slam, right? Everyone knows this. It's on the commercials, it's everywhere," said Osaka, who as a third-grader wrote a paper on Serena. "When I step onto the court, I feel like a different person. I'm not a Serena fan. I'm just a tennis player playing another tennis player. But then when I hugged her at the net, I felt like a little kid again." As it stands, we can no longer call her a “rising star.” At 20, Naomi Osaka has already risen.